Coffee, as a commodity and through its global value chains, is the focus of much interest to achieve fair trade and equitable outcomes for producers, processors and consumers. It has iconic cultural and economic significance for Colombia, which is one of the world’s major coffee producers for the global market. This book examines sustainable coffee production in Colombia, specifically the initiatives of Nestlé to create shared value. It describes the transformation of the coffee landscape by the development of economically, socially and environmentally viable and dedicated supply chains. Suppliers have been encouraged to shift production and quality paradigms, in order to develop long-term and sustainable strategies for higher value and premium quality products. This has been partially achieved by establishing a robust partnership with the Coffee Growers Federation and other public, private and social actors, thereby taking control of the institutional architecture and knowledge base that exists in the country. The book provides an important lesson of corporate social responsibility and the creation of shared value for the benefit of farmers, corporations and consumers. 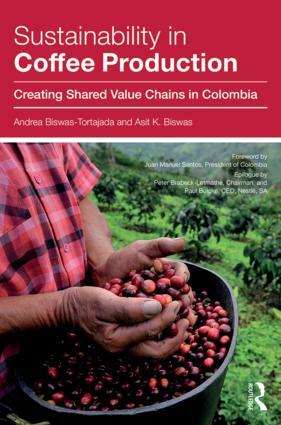 The social and economic importance of coffee in Colombia is analyzed with a political economy perspective in this book. The Creating Shared Value concept implemented by Nestlé and allies, is presented in an applied way, allowing a better understanding of the scope and limitations of the concept in the context of “complexity” described for coffee guild in Colombia. I like the way the authors make a comprehensive review of the issues on the agenda for the discussion of coffee production future, making important arguments to generate a serious debate on the challenges and decisions facing the coffee sector in Colombia to meet the needs of social change for the benefit of producers and the whole supply chain. In this analysis, there is an interesting balance of tasks from coffee farmer level and the challenges to be business oriented and more productive, support services, the role of the market as well as the importance of long term public policies. The kind of actions needed for building social capital, for having a clearer approach to the concept of sustainable coffee and generate prosperity in a sector dominated by small producers, requires a high dose of innovation, policy decisions and foremost the ability to work collaboratively between stakeholder.